Designed by architect E. E. Roberts. We turn off of busy Lake Street (after a pause for sustenance at the reknown Tasty Dog) onto Euclid Avenue, which has an abundance of historically sugnificant houses to rival Forest Avenue. 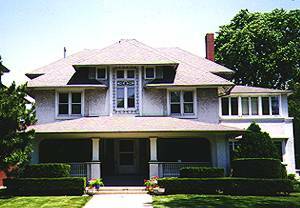 The Magill House is the first prominent house we encounter, designed by E. E. Roberts, and is the first design by Roberts to utilize the vocabulary of Prairie architecture. The source of inspiration for the full width front porch and the formal treatment of the house's front was likely the work of George Maher.